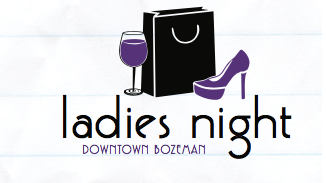 The Downtown Bozeman Association and over 40 participating downtown retailers, restaurants and bars are excited to bring you Ladies’ Night on Thursday, November 15 from 5-8pm including additional “after hours” cocktail specials until 10pm. There’s a little something for EVERYONE!! Nobody enjoys a night on the town more than the ladies, and this event gives them MORE of what they’re craving…a fun, stress-free evening of pre-holiday shopping, dining and cocktailing in Downtown Bozeman! There will be specials and promotions at over 40 downtown retailers, restaurants and bars! So, grab your friends and come downtown on November 15 for a fun and fabulous night out in Downtown Bozeman. Click HERE to see all participating businesses!